Every comet leaves behind a dust trail. Like celestial breadcrumbs, dust and debris from the nucleus mark the path a comet travels through the solar system. Earth returns to the same relative position in space once every 365.242 days. If a comet passes close to this position in space, then Earth will pass through the dust and debris left by a comet once every year on the same day or days. These pieces of dust and debris can create visible streaks of light as they're slowed by Earth's atmosphere. Since it looks like a star is falling, this phenomenon earned them the nicknames like "shooting stars" and "falling stars." Technically, they are known as meteors. Most meteors are the size of a grain of sand, but large meteors can explode or create fireballs as they speed through Earth atmosphere. If the meteor can survive its fiery journey through the atmosphere and reach Earth's surface, it earns the title of meteorite. What is a meteor storm? What is the radiant of a meteor shower? If the debris is dense, it could result in over a thousand visible meteors an hour, and earn the classification of "meteor storm". Get it? Shower. Storm. Each year, the dust and debris left by a comet expands outward in space, like the wake of a boat, making it less dense. This usually results in less meteors an hour year after year. Comet Tempel-Tuttle was traveling 124,000 miles (200,000 km) per hour as it passed close to a point in space that would be occupied by Earth later that year. When our planet reached that point on November 17, 1966, people were treated to one of the best meteor storms in history. It was particularly spectacular in the central and western United States, with reports of thousands of meteors an hour. Encyclopedia Americana claimed that the Leonids in 1833 were even more spectacular, producing "200,000 meteors…between midnight and dawn, numbers of them brilliant, and many leaving trains." What determines if a meteor shower is spectacular or a dud? The single largest determining factor is how close a comet passes to Earth's orbit. According to Don Yeomans, in 1833 and 1966 Tempel-Tuttle passed 0.0012 and 0.0031 AU from the position in space that Earth would occupy later that same year, so the Leonids were spectacularly dense in those years. Keep in mind, if Comet Tempel-Tuttle had arrived at this point in space on November 17, 1833, instead of earlier in the year, then the comet would have been closer than our Moon. Earth and/or the Moon could have been hammered by large debris, fragments, and even Comet Tempel-Tuttle's 2.2-mile-wide (3.6 km) nucleus. So next time you "ooohh and ahhh" during a meteor shower, consider the source. Remember that a comet passed close to Earth's orbit. Our planet is racing through a celestial battlefield, and it's only a matter of time until one of these cosmic bullets has our name on it. Imagine standing in a snowstorm at night. You would perceive all the snow falling at roughly the same speed toward Earth. Now imagine getting in your car, at night, and accelerating to 50 miles an hour with the headlight on. What does that same snow look like in your car headlights? If you have ever lived in a part of the world where it snows, you don't have to imagine it. You know that the snow appears to radiate from a central point illuminated by your headlights. Why? It's due to your car moving quickly, at 50 miles an hour, through something that's moving much slower. Your perception changes. Meteor showers work the same way. Earth is revolving around the Sun with immense speed. When it plows through the dust and debris left by a meteor shower, the meteors appear to radiate from a single point. Meteor showers are typically named after the constellation from which the meteors appear to radiate. For example, the meteors in the Orionid Meteor Shower appear to move away from the constellation Orion. The radiant of the Quadrantid Meteor Shower, a meteor shower in early January. The Quadrantids are unsual since they do not reference any of the 88 officially recognized constellations in use today. However, prior to 1922, Quadrans Muralis was a constellation. The first verifiable record of a meteor shower was on March 16, 687 BCE, by the Chinese astronomer Zuo Zhuan. He wrote, "夏四月辛卯 夜 恆星不見 夜中 星隕如雨 (...at midnight, stars dropped down like rain)." It was later determined that what Zuo Zhuan was witnessing was the Lyrid Meteor Shower (Johann Gottfried Galle, 1867). Only six meteor observations have been found that can be dated prior to 1 CE (Imoto, S. & Hasegawa, I.). Five of them belong to Chinese astronomers. In ancient times, the Koreans, Japanese, Arab, and European also recorded meteor observations. Although, several myths and religious texts undoubtedly refer to meteor showers, with "stars falling" from the sky, none can be connected to a specific year, month, or day. Fall of a Thousand Suns: How Near Misses and Comet Impacts affected the Religious Beliefs of our Ancestors sheds light on some of the stunning impacts and near misses that our ancestors experienced. The Chinese were among the greatest ancient astronomers. The General Compilation of Chinese Ancient Astronomical Records (1988) is a compilation of Chinese records dating up to 1911 CE. It contains roughly 5,700 observations of meteors and 276 meteor showers. In 1958, Imoto & Hasegawa published a list of meteor showers recorded by ancient Chinese, Korean and Japanese astronomers. There were 118 meteor showers including 59 from China, 36 from Korea and 23 from Japan. The 59 Chinese records were complied from 19 historical books. Korean history from 57 BCE to 1910 CE, is recorded in only three official history books: Samguksagi (The History of the Three Kingdoms; Kim et al., 1145), Goryeosa (The History of the Goryeo dynasty; Kim et al., 1451), and Joseonwangjosillok (The Annals of the Joseon dynasty; Chunchugwan, 1392-1863). The astronomical observations begin with a solar eclipse in the fourth year of Hyeokgeose. This solar eclipse has been verified and pegged to 54 BCE (Park & La 1994). Samguksagi details 13 major meteor showers that happened between 54 BCE to 935 BCE. In Goryeosa, which covers the time between 918 CE and 1392 CE, there are 740 recorded meteors, but only seven meteor showers. When a single meteor appeared its direction and path through the constellations was described in great detail. 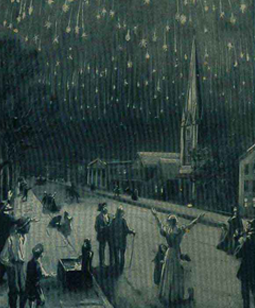 When a meteor shower occurred, the detail was simply "stars flew in all direction." No radiant was determined. Since Korean dates were all recorded in the lunisolar calendar they have to be converted to the Gregorian calendar. This is called the Korean Chronological Tables (Shim et al., 1999; Ahn et al., 2000a, Ahn et al., 2000b; Han, 2001). Japanese meteor showers were compiled into three books: Japanese Historical Astronomical Records (Kanda, 1935), General Inventory of Japanese Historical Astronomical Records (Kanda, 1936), and Japanese Historical Astronomical Records after 1600 (Ohsaki, 1994). Japanese Historical Astronomical Records and General Inventory of Japanese Historical Astronomical Records cover meteor showers before 1600 CE. Combined they list 431 meteors and 13 meteor showers. In 1866, Italian Giovanni Schiaparelli became the first person to connect a specific meteor shower with a specific comet. Schiaparelli demonstrated that each November Earth travels through the dust trail left by Comet Tempel-Tuttle, a comet that returns to the inner solar system once every 33.17 years. Since Schiaparelli's revelation, several comets have been determined to cause specific meteor showers.